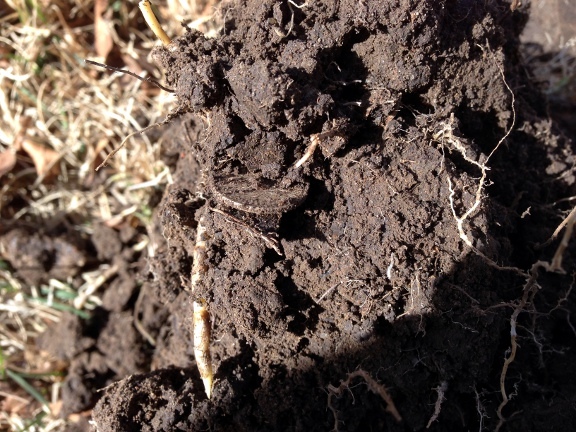 Although I haven’t been posting lately, I have been able to get out and dig a thing or two. I have been concentrating on a particular spot at a particular park with the long term goal in mind of eventually hitting it with a P.I. machine or maybe even with a BlissTool. To that end, I have been digging up all targets and I am now left with only tiny pieces of foil, which the Deus hits hard at very impressive depths. 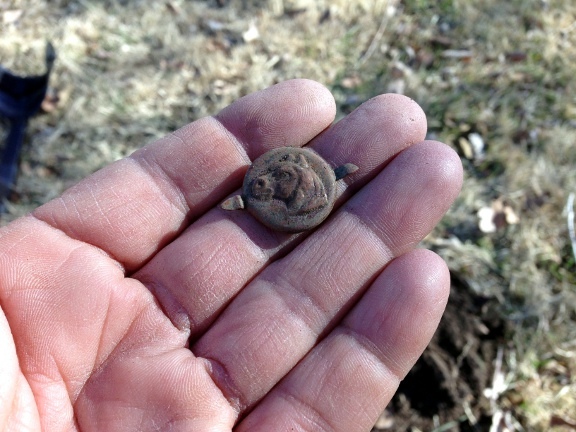 Still, I continue to be amazed that after almost a year of hunting this spot, I still find interesting objects there. 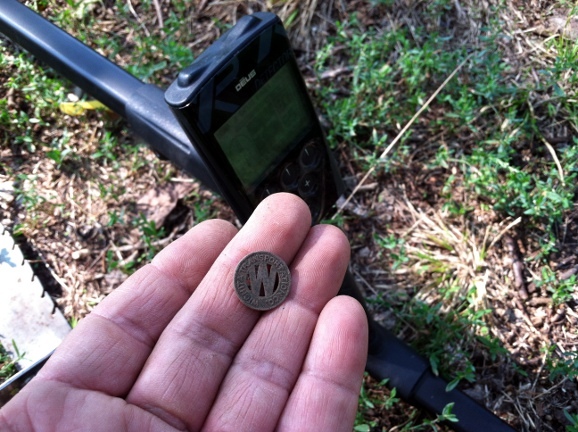 A couple of weeks ago I was very surprised to find this Wichita Transportation Co. token at about 6 inches down. About 20 yards away from this one, on a different day, I found an even earlier version of this token from when the company was called The Wichita Railroad and Light Co. 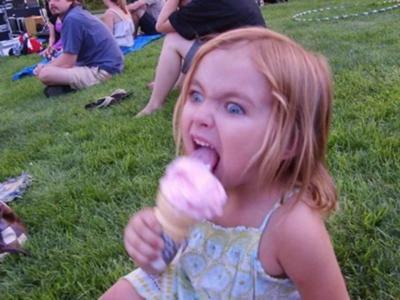 Unfortunately, I misplaced that picture. 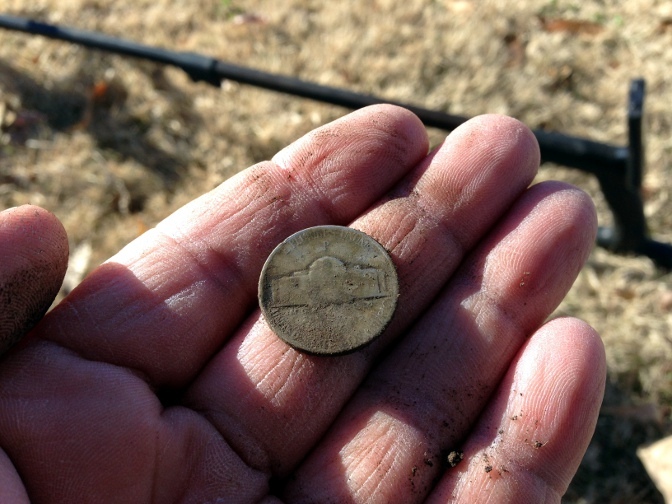 At a different park, I found yet another dateless Buffalo nickel. I don’t get tired of them though! 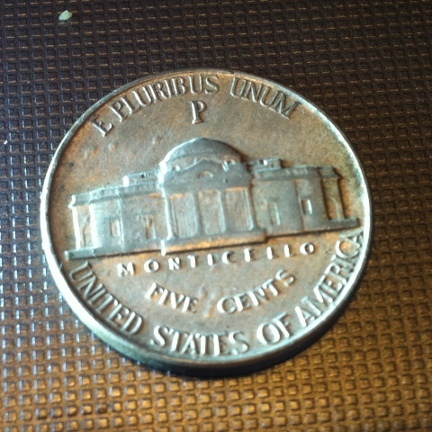 And speaking of nickels, one of the things I love to do with the Deus is to turn it into a nickel machine by changing the tones and by using notching. 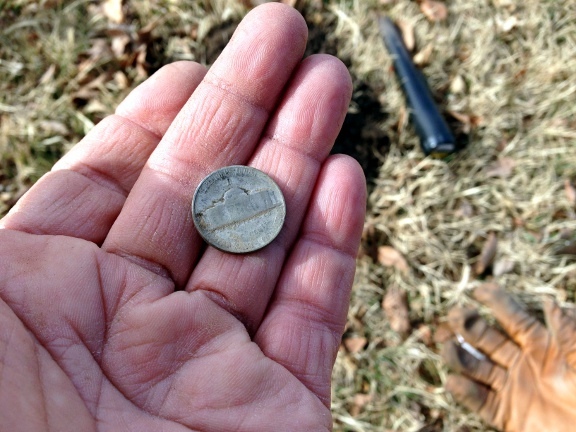 There are countless nickels in our city parks just waiting for me to dig them up. 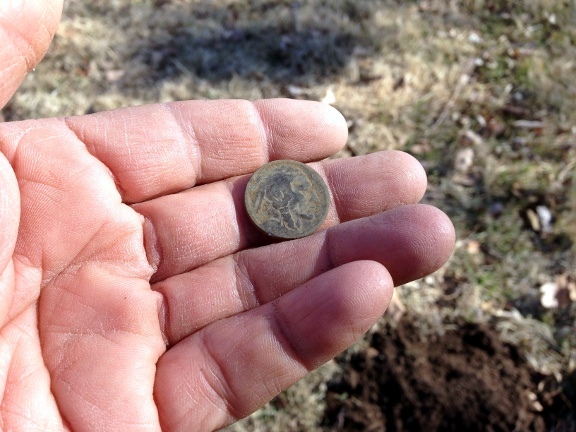 And I continue my search for more gold even as my friends Patton and Steveouke are cleaning up on the silver coins. Fall is here and I should be able to get out more often. Stay tuned! 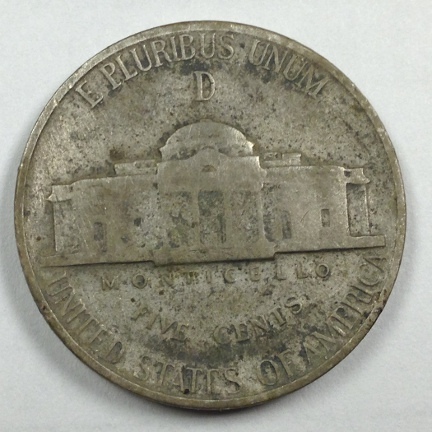 This is Jefferson nickel number eight from around the Girl Scout House in Riverside park since I got the CZ-3D a couple of weeks ago. 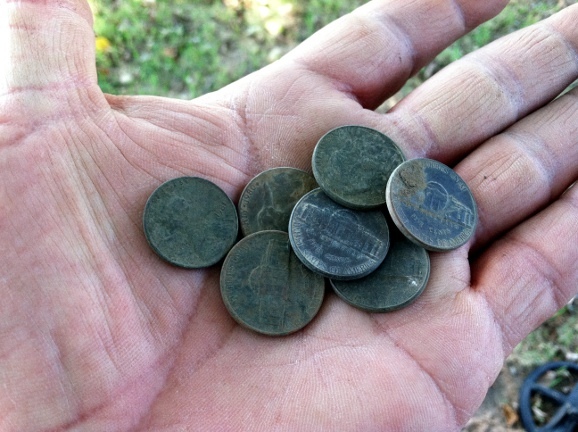 I missed these eight nickels with my V3i. To boot, I’ve re-scanned only about 10% of the area. Who knows how many more Jeffersons are in there, not to mention Buffaloes and V nickels, along with other goodies. I am stoked! I’ve been using the CZ-3D lately and I am happy with the unit except that I haven’t yet reached very deep with it. As a result, my finds have been less than interesting. So today, I brought out the big gun. 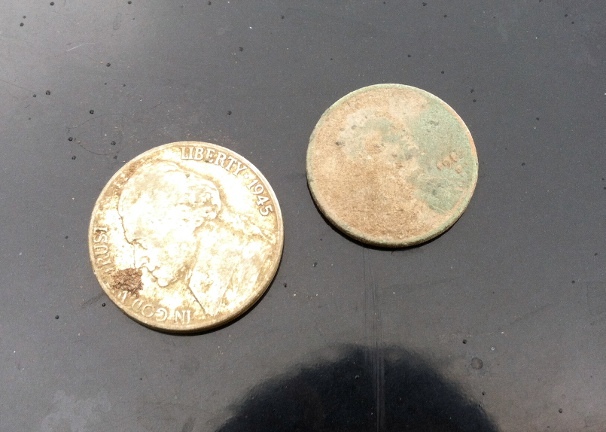 I hit a couple of places this afternoon with my V3i and finally I got some silver out of the ground. The signal was not a signal that I would have dug a couple of weeks ago but since using the CZ, I’ve developed new instincts. 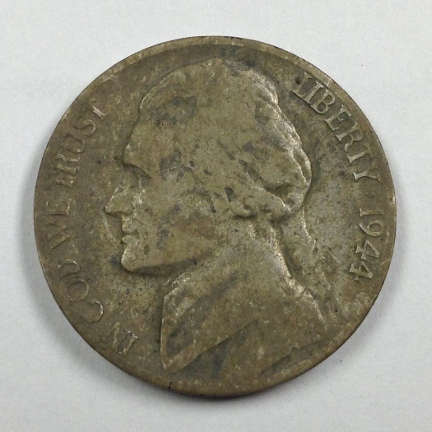 The nickel was a 1945 P Jefferson nickel and it was between seven and eight inches down. The signal had wrap-around and the VDI was jumpy but the high tone was consistent all around. 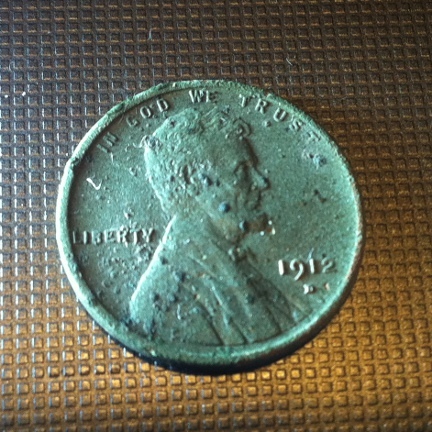 The other coin I dug today was a 1912D wheat cent. I may be turning into a snob because anymore, I don’t brag about wheats unless they are in the 10’s. This signal also wrapped around but now and again, I got a clean hit with a VDI of 72 so I dug it and I am glad I did. The coin was six inches deep. Anyway, I am still eagerly awaiting the arrival of the 10.5 inch coil for the CZ. I expect great things from it just as I expect great things from my V3i. One day, when I was just starting in the hobby with the Ace 250, I was scouting for locations to hunt and I decided to cut through an apartment complex on my way somewhere else. As I was walking past their courtyard, the first thing I noticed was that everyone in the complex owned dogs. At least it seemed to me that way because of the amount of dog poo laying around. 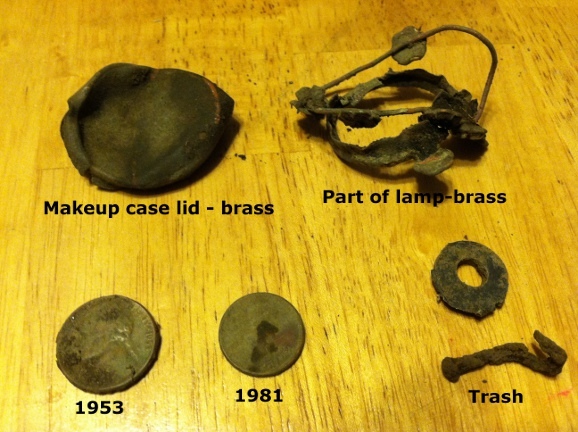 The second thing that grabbed my attention were the coins that were strewn about on top of the dirt. 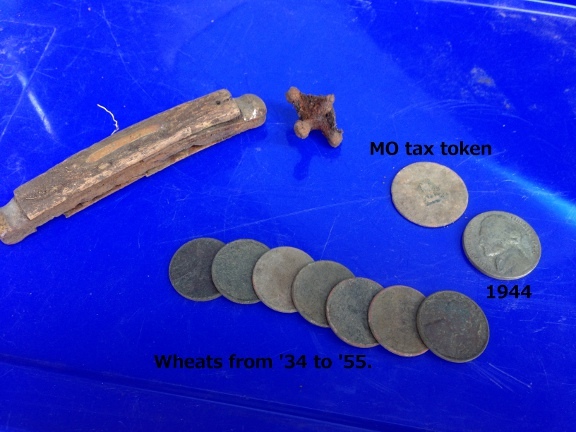 As I began picking them up I realized each and every one was a wheat cent, ranging in date from the 20’s to the 40’s. 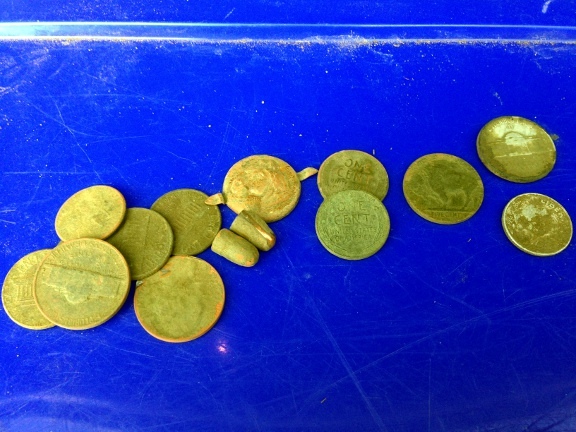 I could tell that these coins had been washed out by the rain. I was so excited that I forgot this complex was private property. I hunted the courtyard with the 250 but found only old trash. Eventually I returned with the AT Pro and found my 1899 Barber quarter. I did some research and found that this was the site of one of the first neighborhoods in Wichita. The two ‘relics’ are from the 19th century. Knowing that rain was moving in today, I went hunting early in the morning before work. 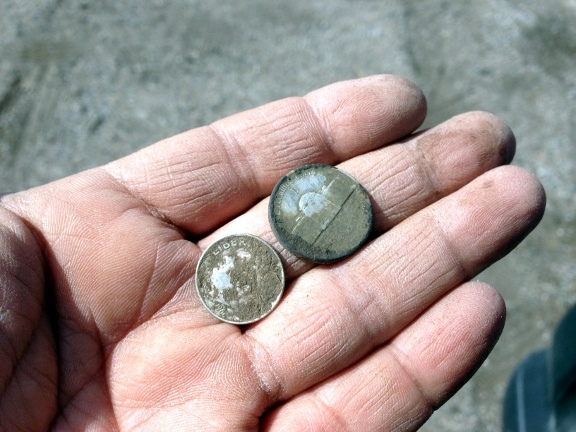 I returned to the spot where I found the Indian Head cents and the Buffalo nickels back in February. 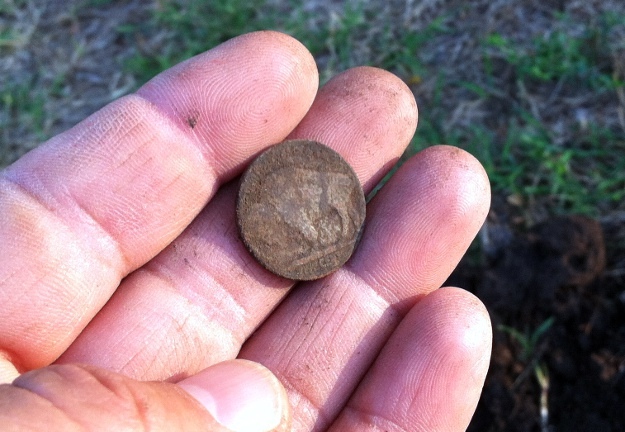 The site has been hunted heavily before I found those coins and after. I know in March the spot was hit hard by two Etracs, two V3i’s, one Teknetics G2, an Ace 250, a Bounty Hunter, and an ancient White’s with no tone id. And that’s just the people I know about! At least three of us grid so the chances of finding anything left is minimal. But the CZ-3D is a totally different animal. It’s not that the CZ-3D assigns a high tone to nickel signals. I can do that with the V3i and I’ll be digging pull tabs all day long! 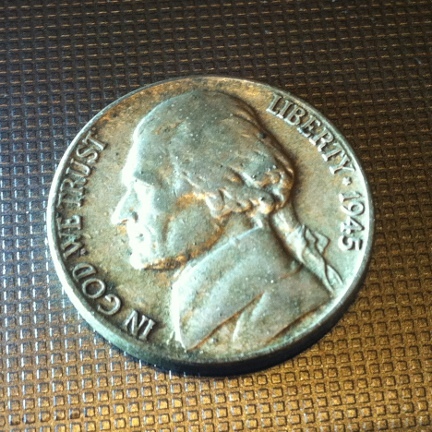 No, the CZ-3D sees the nickels differently. 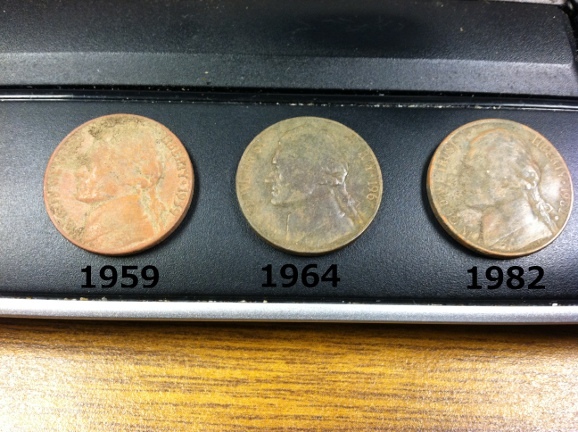 It also sees all other old coins differently. 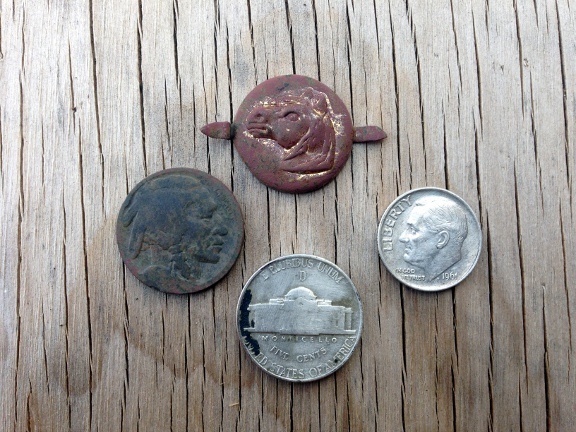 So this morning I found three nickels that we all missed. My guess is that if I checked these signals with my other detectors, they would have sounded like trash. So I am happy with the CZ-3d. I’ve ordered the 10.5″ spider coil to get at the deeper coins. I forecast more Buffalo nickels and maybe even V nickels in my near future, to say nothing of other old coins that may be registering as trash to everyone else.